Be it any business, customers will be a part of your business to avail your service. If your service is satisfying the customers you can stay profitable with your business. The same merges well with the Taxi business. You need to ensure customer satisfaction in the taxi business because customers are the key to your success. Accomplishing the taxi business with very good feedback from customers is not an easy task and it requires full dedication and sheer passion to move forward with your taxi business in a very successful way. You need to analyze the customer needs to implement the same facilities in your service to attract more customers to your business. So customer satisfaction is a major part where you have to focus and elevate your taxi business. A Taxi software can help you Serve your customers well to enhance the pace of your taxi business. 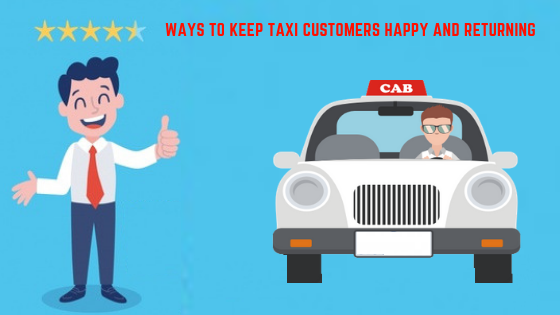 In this article, we will see some tips to keep the taxi customers happy and satisfied with your service. The main target of any taxi business is to attain its high-level service. When your service is spread to a huge number of customers, it will definitely take you to the top and can stay profitable. This is feasible only with your dedicated drivers who need to be very pleasant to should help your customers during their travel. You should hire qualified drivers who have a passion for driving and not simply money-minded to complete their ride by their rash driving. Drivers must take care of your customers to improve your taxi business. Proper interaction between the drivers and the operators are very important for customer service. The major complaint you will always hear from the side of the customer is the taxi has not reached to pick them and it is delayed. Drivers always wait for the taxi booking from which they earn more money and they keep on delaying other earlier bookings made by the customers. This will affect your taxi business as the customers will not be happy with your service. Now the operators need to follow up with the drivers to make them reach on time. All these may happen because of improper communication between operators and drivers. This should be solved to satisfy your customers. This can be done with the proper use of any tool or software to track the drivers in order to avoid the delay in picking the customers. As I have already discussed in the previous point that the operators and drivers should have a proper interaction to avoid any miscommunication. The operators of the taxi business almost call operators and these call operators need to call the drivers and track the location of the driver. It is not an efficient way to work as it takes more time to update the driver location to the customers. Here comes the need for Taxi dispatch Software and the tools to track the driver. This software will allow you to set up a Taxi App which can be used by the operators to track the booking and the driver location instantly using the Google Map by enabling the GPS. This technology will improve the customer experience as the drivers are tracked by the operators to improve efficiency. You always need to focus on and analyze the actual needs of the customer. In olden days it is booking a taxi and paying out the fare for the ride. It is very difficult to get good feedback from customers. Once the smartphone has evolved with its new features the customer expectation increased. You need to address the customers concerns like the customers need to track the exact location of the driver and the number of taxis available near customer location, the arrival time of taxi, duration of the journey and customers want to provide customer feedback regarding the journey to improve your service. You can achieve this with your Taxi App providing all such access to the customers. This will improve customer satisfaction and will also enhance your business. Focussing on targeted customers is going to make them more happy with your service. When you start your business at one location and gain good customer feedback, don’t change your service location suddenly. This will impact the satisfaction of the customers. Usually, the customers will stick on to one of your services in a particular location. When you like to expand your service always analyze the good feedback and provide your service at any particular location. Improving your service in a particular location of targeted customers will enhance customer satisfaction. Anyone likes offers, discount and promo codes in any business. This will attract a huge mass to your business and customers will be more happy to avail your service with such good offers. In the busy world, customers want to pay the fare using their credit/debit cards instead of always keeping money in their wallet. You need to provide such payment options to the customers like instantly paying the fare using their cards. In your Taxi App, you can also provide a wallet option to load their wallet through net banking and they can go cashless for any ride. This convenient options for the customers to pay the fare will help to improve customer satisfaction. In any taxi business, the quality of the taxi is an important factor to consider. The look and appearance, good condition of the taxi will impress your customer a lot. Hope in this article you will find the tips to improve customer satisfaction. Follow these tips to make them happy and returning home with complete satisfaction. Always provide your best service to maintain a good relationship with your customers. If you are interested in knowing how to enhance your User experience through the usage of a Taxi Software, Try a Free Cab Management Software Demo. It is also equally important to know how to improve your taxi company to stay competitive in the Taxi Business and to attract more customers.